Terrence Boyd made his first appearance with the USMNT before he had cracked the senior squad for his club. With Borussia Dortmund on their way to a Bundesliga title, Boyd moved to Rapid Vienna at the end of the 2011-12 season where he instantly made an impact. 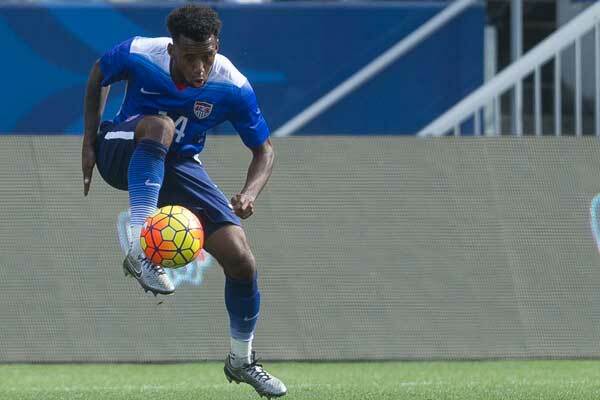 A player with a ton of upside, Boyd brings a strong attacking mentality to the USMNT. Boyd moved from the Austrian Bundesliga to the German Bundesliga in July, 2014, signing with RB Leipzig. Boyd missed most of two seasons with ACL injuries, returning for the USMNT in October, 2016. He moved to Bundesliga club Darmstadt in January, 2017. In February, 2019 he moved to MLS joining Toronto FC. 2016: Subbed on against New Zealand on Oct 11. 2014: Named to the provisional World Cup roster. 2013: Subbed on in the Jun 2nd friendly against Germany and in the second-half in the World Cup Qualifier against Panama on Oct 15. Subbed on against Scotland on Nov 15 and Austria on Nov 19. 2012: After appearing for the USA's Under-20 and Under-23 squads, Boyd won his first senior cap against Italy on Feb 29th and got his first start against Scotland on May 26th. Played in the June 8th World Cup Qualifier against Antigua & Barbuda. He also was part of the USA's Olympic team in qualifying. Subbed on in the second-half against Jamaica on Sept 7th. 2018-19: Spent the first half of the season with Darmstadt before completing a move to MLS with Toronto FC. 2017-18: Finished 10th with Darmstadt in the 2.Bundesliga. 2016-17: Recovered from injury, transferred to Darmstadt during the January window. Darmstadt finished in 18th-place and dropped to the 2.Bundesliga. 2015-16: Missed the entire season with RB Leipzig finishing 2nd and winning promotion to the Bundesliga. 2014-15: Signed with Red Bull Leipzig in the German 2.Bundesliga. An ACL injury cut short his season with RB Leipzig, playing in seven games and scoring twice. The club finished 5th. 2014-14: Played in 29 games for Rapid Vienna, scoring 15 goals. 2012-13: Signed with Rapid Vienna in Austria's Bundesliga where he became an immediate starter. Scored 13 goals in 30 games for Rapid, finishing 3rd. 2010-11: After starting his career as a member of Hertha BSC, Boyd played 32 times and scored 20 goals for Borussia Dortmund's reserves.